i'm going with starbucks verona. it's my fav! I've been using the Keurig Platinum for a few years now but jumped at the chance to try the Tassimo T20 by Bosch. I've always been a fan of Bosch design, everything is sleek and purposeful in that peculiarly Teutonic way. The Tassimo T20 is no exception, with a slim and compact profile that makes my old brewer look archaic. Tassimo T-discs come in more than 40 flavors from well-known brands like Gevalia, Maxwell House, Twinings and more. My favorites thus far have been Starbucks Latte and Cappucino, which taste just like the originals at a fraction of the cost per cup. Check out that foam! 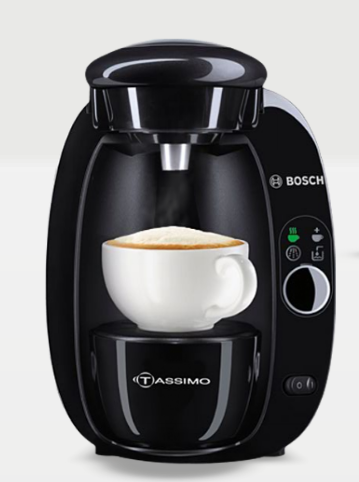 To enter and win your own Tassimo T20 by Bosch, please comment on this post with your favorite T-Disc Beverage. Entries will be accepted through February 9th and I'll pick the winner using Random.org. US readers are eligible. Disclosure: In accordance to the FTC Guidelines and WOMMA Code of Ethics, I am disclosing that I received a Tassimo T20 by Bosch to facilitate this review but all opinions are decidedly my own. and facebook. now i'm beginning to sound like a stalker. My favorite T-Disc beverages are Starbucks Colombia, Maxwell House Skinny Cappuccino, and Mastro Lorenzo Espresso :) *Thanks* for the giveaway! My favorite would be the Gevalia Cappuccino. Following you on Twitter (@frugalfunfamily). Like you on Facebook (Michelle Robinson). My favorite T-Disc is the Starbucks House Blend! I put your blog button up! I just tried the Gevalia Signature Crema Coffee at a friends house last month, delicious!! I am a fan on Facebook as Heather ArmyWife. I subscribe via email and reader. I like the Maxwell House Caramel Machiatto. It's so yum. I'm pretty sure my favorite would be the Tazo Awake Tea. I'm drinking lots of hot tea lately and this is one of my favorites. I would like to see some other flavors of Tazo as well. The Starbucks® Africa Kitamu™ sounds very exotic. And caffeinated, which is important! I love the Milka Hot Chocolate T-discs. I'd choose Starbucks' Breakfast Blend. I would try the twinings tea. I like the Gevalia Swiss Hazlenut! This is a great product, Bosch is one of the best brand in the market today.